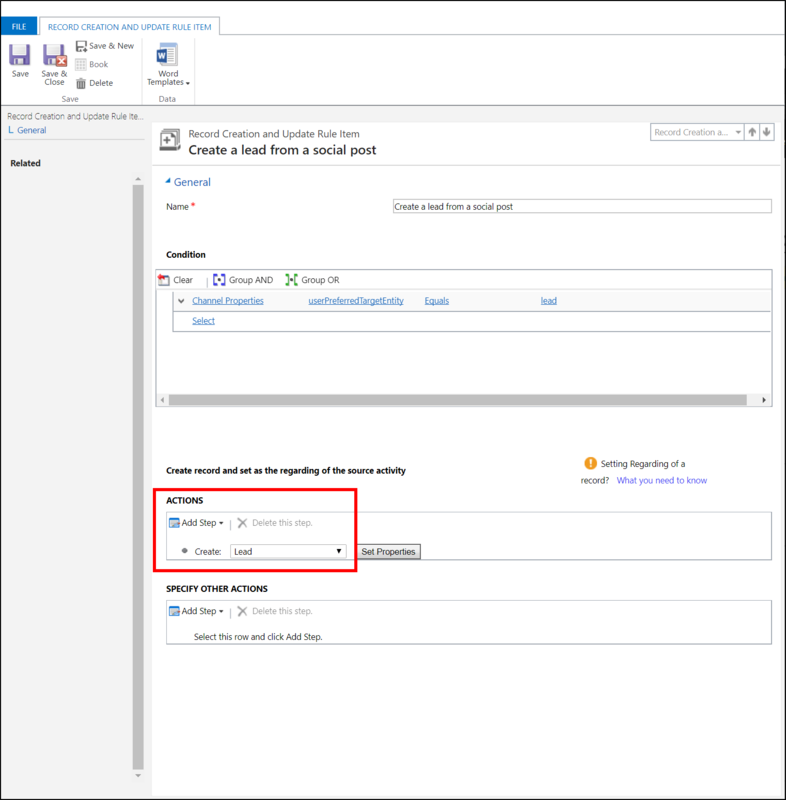 To automatically create an entity record (such as a Case or a Lead) from a Social Activity record in Dynamics 365 for Customer Engagement apps, an administrator or customizer must configure Automatic Record Creation and Update Rules. In Social Engagement, when users link a post to Dynamics 365 for Customer Engagement apps, a Social Activity record is created in the connected Dynamics 365 for Customer Engagement instance. 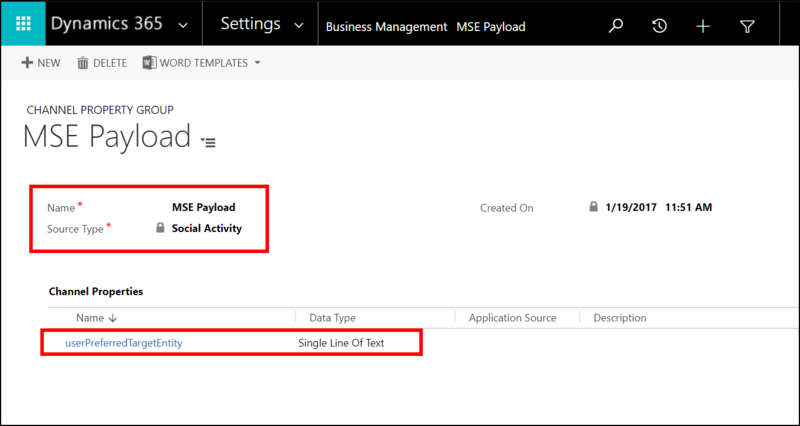 The entity type the user creates in Social Engagement (Case, Lead, and so on) is passed on as part of the JSON Payload to the social activity in Dynamics 365 for Customer Engagement. Without Automatic Record Creation and Update Rules, the Social Activity record does not automatically result in a corresponding Dynamics 365 for Customer Engagement entity record (such as a Case or Lead record). Sign in to Dynamics 365 for Customer Engagement with your system administrator or customizer credentials. Go to Settings > Business Management > Automatic Record Creation and Update Rules. Select New to create a new rule. Provide a Name for the rule. Set the Source Type to Social Activity. Click Save to create the record. Under Channel Properties, select Additional Properties. Select the Search button, and then select New. In the new dialog box, provide a Name for the Channel Property Group. For Source Type, select Social Activity. 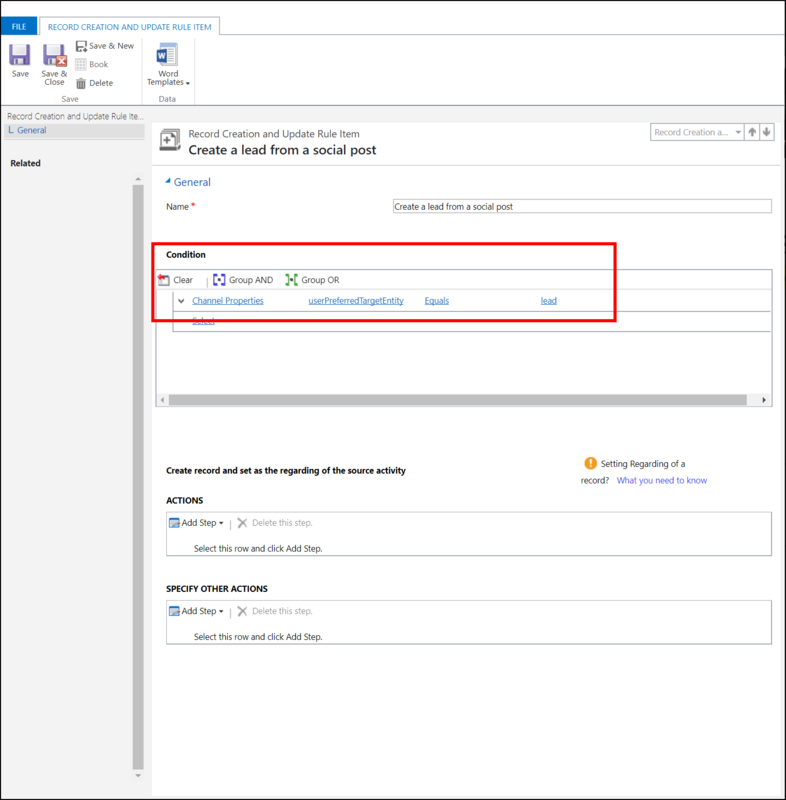 Select Add Channel Property record in the newly created Channel Property Group. Enter userPreferredTargetEntity for the name, and set the Data Type to Single Line of Text. It's important that you match the name as documented in the JSON payload. Now that the Channel Property is in place, you create the actual update rules. Select Save, and then close the dialog boxes. In Record Creation and Update Rule, select Add Record Creation and Update Rule Item record. In the new dialog box that opens, provide a Name for the rule and then select Save to create the rule. Under Condition, choose Select, and scroll to the bottom of the drop-down list to find Channel Properties under Local Values. Then, select userPreferredTargetEntity Equals lead. The value for userPreferredEntity must exactly match the value in the JSON payload. This value is the Dynamics 365 for Customer Engagement entity type name that can be different from the name in the Dynamics 365 for Customer Engagement user interface. For example, the entity type name for Case is incident. Under Action, select Add Step, and then select Create Record. Set the value to Lead. Click Save & Close to finalize the rule. Verify that the rules were created, and then select Activate to activate the rule. 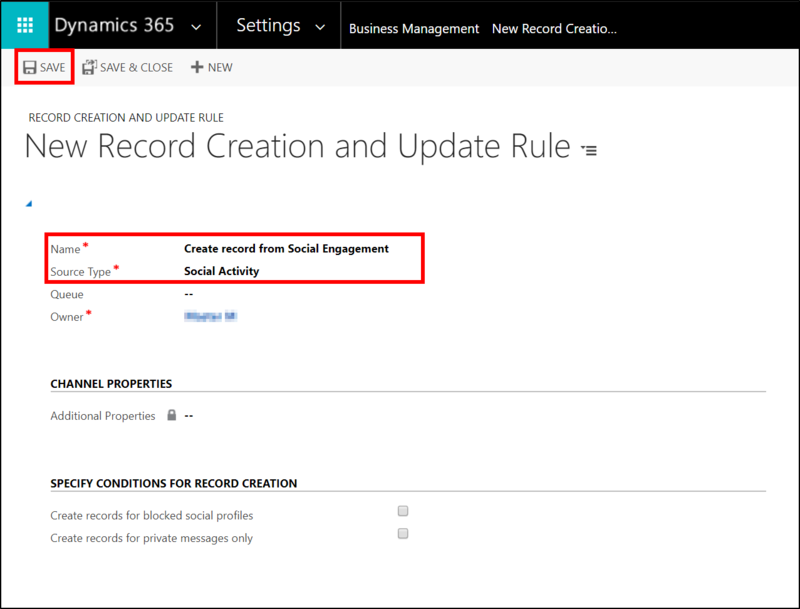 Social Activity entities created from Social Engagement will now automatically create the configured record type in Dynamics 365 for Customer Engagement. To create a Case record, repeat the steps above but select userPreferredTargetEntity Equals incident, and under Action, set the Create Record value to Case.